Cleaning out your closet is often a dreaded task because you are faced with difficult choices regarding what you want to keep, what you want to store and which items need to just be tossed. We’ve made it simple for you. Just follow this handy guide and you will be able to clean out every closet in your house in a jiffy. Keep a few garbage bags handy to place the items you are getting rid of or plan on storing. they aren’t taking up closet space. When you have tossed everything that needs to be tossed, move on to the next step. 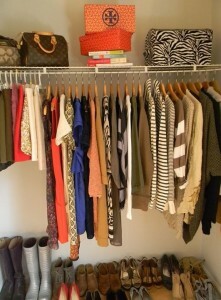 You will want to store certain items that you still like, fit you and are in good shape. However, some of these will not be appropriate for the time of year. So pack away those bulky sweaters, fleece lined pants and wool socks. Make room for your spring and summer wardrobe. Maternity items are another category that need to be stored away and taken out only when needed. If you just found this for religion clothing & t shirts that you love but it’s winter, get a storage unit to store your excess stuff until it’s warm again. By sorting your clothes according to the first two categories, you are now left with what to keep. Organize these however you wish, but in a way that makes sense to you. Some people like to organize by color, and some like to organize by type. Hopefully you will have trimmed down your closet significantly. Now step back and eye that closet. Doesn’t it look better? Pat yourself on the back for a great accomplishment. Get rid of those toss and donation bags as soon as possible to avoid the temptation of pulling out that horrid knitted sweater your aunt made you and placing it back in your closet.